I’m not a vinegar lover. It normally doesn’t get me excited. But I wuvs me some of this stuff — balsamic vinegars infused with ginger, pear, and raspberry. I use them separately, or in combinations for a special flavor treat. It’s only been in the last few years that I’ve come to enjoy vinegar. It’s just too, well, fermented. My mother and The Hub are abba-sootly NUTS about pickled this and pickled that. Not me. So, it’s kinda odd that I am in total love with this vinaigrette salad dressing. I’d go so far as to say I’m madly in love with it. I eat it nearly every day and make it with several variations. I got the basic recipe from It Starts With Food where it’s listed as Classic Pantry Vinaigrette, and developed it from there. I like sweet(er) dressings and I like apples or pears and a good sprinkling of nuts on my salads. This dressing is perfect for those kinds of salads, or just sprinkled over some plain ol’ greens, or as a tangy seasoning when added to the tail end of the cooking time for sauteed veggies. And it’s good and garlicky, too. 6 Tbs. 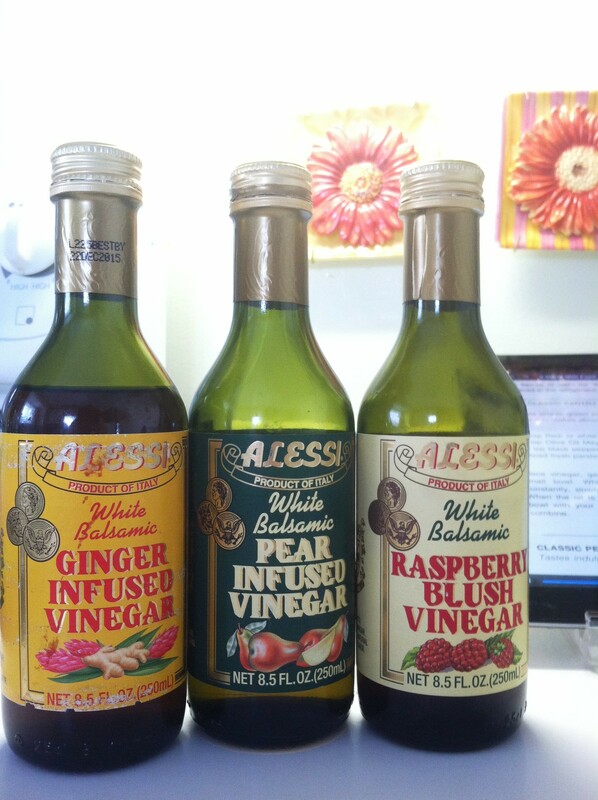 white balsamic vinegar infused with pear, raspberry or ginger. I sometimes use only one vinegar, but I will often combine two or all three. My favorite is with all three, as follows: 4 TBS. pear-infused, 1 Tbs each of raspberry-infused and ginger-infused. Put everything but the olive oil in a small bowl or a large cup. I like to use a large measuring cup with a pour spout because I’ll pour the dressing into a long-necked bottle (a recycled olive bottle). The pour spout makes it easy to get the dressing into the bottle without making a mess. 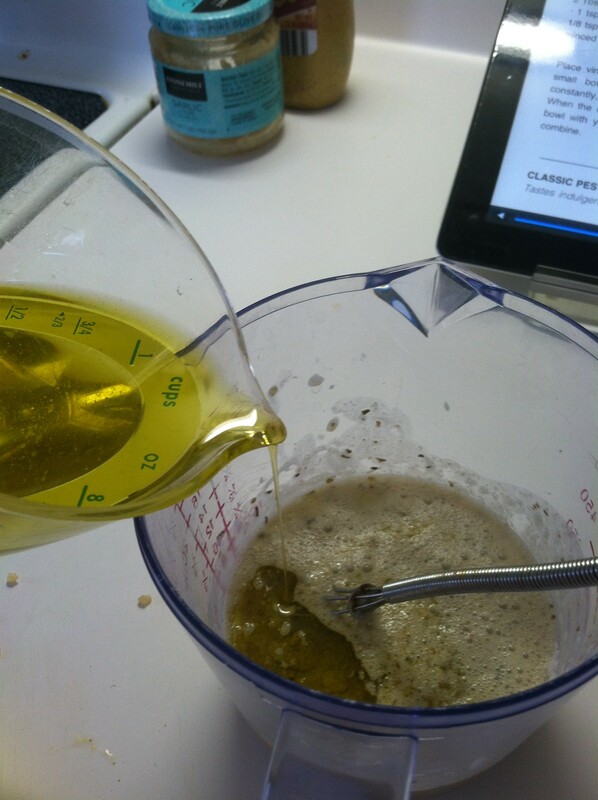 Before you add the olive oil, make sure the other ingredients are thoroughly stirred. I use a small whisk, and I make sure the salt is dissolved before adding the oil. 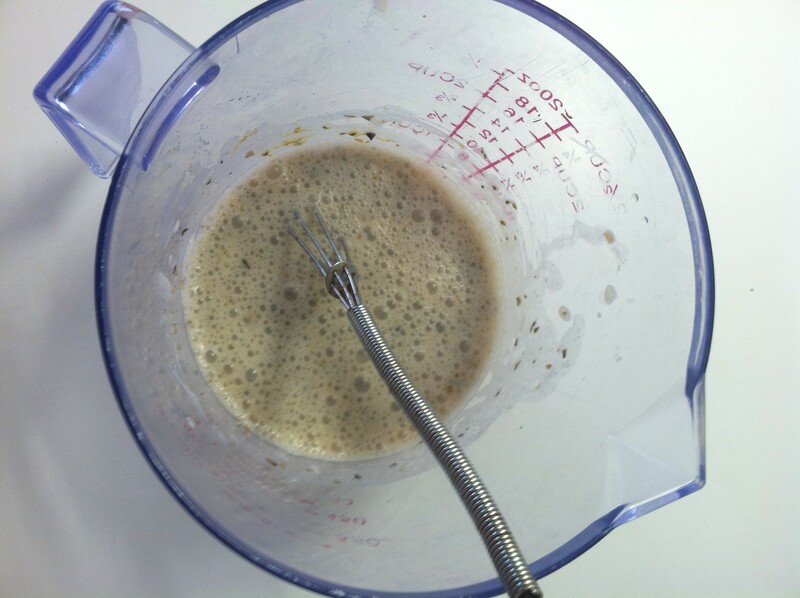 Whisk the ingredients together until the mixture looks kind of milky. Make sure the salt dissolves before adding the oil. Pour the oil slowly in a thin stream into the vinegar mixture and stir with a small whisk or a fork as you pour. Keep stirring until everything is blended. The mixture will be a bit thin, but will thicken after it sits a while and it also thickens when it’s cooled in the fridge. Pour a fine stream of oil into the other ingredients and stir as you pour. It will mix up beautifully. It might be a little thin at first, but after it sits awhile, and definitely after you refrigerate it, it will be nice and thick. 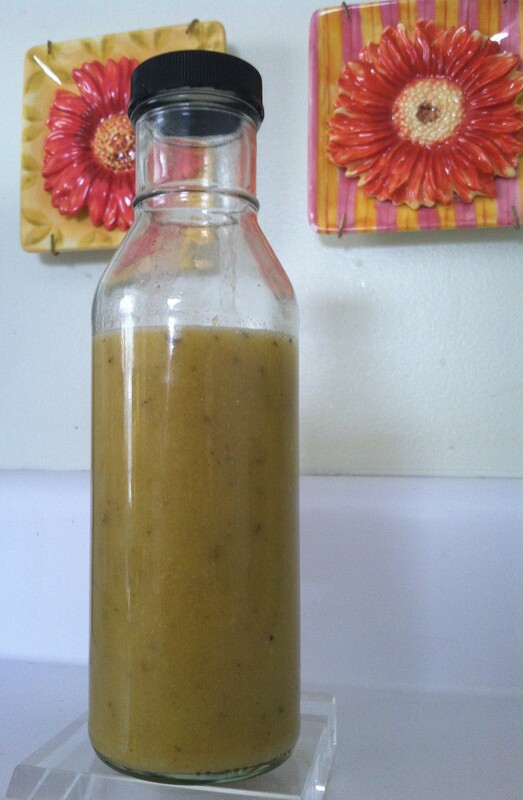 Transfer the salad dressing into a glass jar or bottle that has an airtight lid. Refrigerate until you’re ready to use it, then remove it from the fridge and let it sit 5 or 10 mins.at room temperature until it’s easy to pour over your salad. Shake it up good before you use it. The garlic and cracked pepper will settle to the bottom, and you want to get that good stuff on your salad! Mouthwatering vinaigrette, the kind you can’t keep your finger out of. No double dipping after you’ve licked your fingers!